Martin has been a professional musician and teacher all his life. He started with the Royal Marines, then came to Egypt between 2000 and 2004 and then sailed around the world on cruise ships while playing the piano. This sounds nice sailing around the world but you don’t see that much if visits to countries are only limited to ports. But each port has a city. So Martin did see Barcelona a lot and Montreal, New York and many other locations such as the Antarctic and the Arctic. In fact Martin has managed to see the world many times over. And often he stayed onboard the ship for a rest while the guests went on their tours. It was a life with much music but also much drinking on these cruise ships. Martin had enough of this and decided to return to Egypt. Martin loved Egypt and its people so much he was always thinking of returning to have a rest, and then plan the next step on his very full and complicated CV. CAWU agreed to provide Martin Orbidans with a room in the CAWU premises. 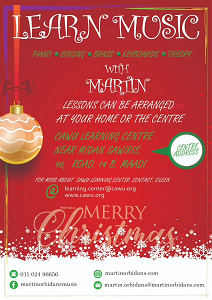 In return Martin will provide the students at the CAWU Learning Center with music lessons. These will be for free for those who cannot afford paying for those music lessons. Others will pay and part of this will be used to pay for the running costs and rent of the Learning Center. Martin bought a teaching piano and a keyboard but more instruments are needed. If you have any unused musical instruments that you no longer need then these would be most welcome, in particular keyboards and percussion instruments for rhythm training (tambourines, tablas or maracas). They might be loaned or given to the Learning Centre. If you are living in Egypt you are invited to see the music room in our Learning Center and if you are outside Egypt you might be sending them to my address in the Netherlands and I will take them later to Egypt. Perhaps a teacher from a school might have some music posters or resources for the wall? Martin has brought some teaching materials from the UK but more would not go amiss. “It would be my intention to eventually buy them anyway as my funds allow,” Martin says. “But I feel that things may grow step by step which is best. I am aiming to get three more keyboards.” Martin spent time teaching for the Yamaha Music School foundation and can teach groups. Groups work so well as there is a fun social aspect to each group and a bit of competition for each student to perform within the group each week. This fosters a great culture for improvement. And lessons are naturally friendly and often addictive. As part of our cooperation Martin advertised in the Maadi Messenger and explicitly mentioned our Learning Center. We are very grateful that Martin is contributing in his own way to our CAWU Learning Center and making it a true refuge for children and youth who have sadly had no opportunities to receive education elsewhere.